Her Other Side is a 50-60 minute performance by Hind Benali (Morocco/Compagnie Fleur D’Orange) and Esther Baker-Tarpaga (USA/Baker & Tarpaga Dance Project). The work comments on and undermines hyper stereotypes of “American” and “Arab” female bodies. The performers interact with the audience to implicate them in their questions on power, constraint, freedom, and sexuality. This transnational collaboration between two female artists compares cultures finding visible differences and similarities, yet finds common ground in social constructs, manipulations, and violence towards the female body. 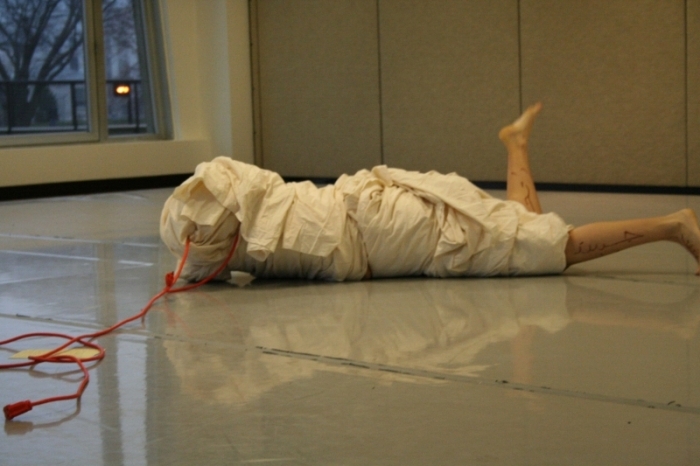 The work draws from the performers backgrounds in performance art, improvisation, dance theatre, and belly dance.